Sand Street, located in the town of St Helier in Jersey, is home to one of the main central multi-storey car parks which houses over620 parking spaces over 14 levels. 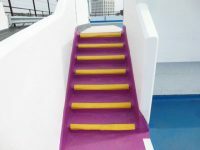 Continuing their long and successful working partnership, States of Jersey selected Triflex to renovate all internal and external decks, ramps and stairwells of the failing car park. It was imperative that local businesses in the surrounding area were not directly affected whilst works were completed, meaning noise levels and dust generation must be kept to a minimum. Prior to work commencing on site, Triflex carried out extensive core testing to identify the existing substrate and the requirements needed for the refurbishment of each level. The twelve internal concrete decks were not only displaying the general wear that you would expect to see from a heavily trafficked car park, but were also showing signs of cracking, particularly around the columns. A number of previous resin repairs had also failed to fix the cracking previously. 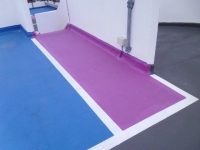 As the cohesive strength of the concrete decks and ramps was so poor, a specialist Triflex Primer was applied prior to the installation of Triflex DCS-C overlay solution. This priming layer, which is not always required, improved the cohesive strength of the concrete to an acceptable level without the need for extensive removal and repair of the existing concrete, which could have caused major disruption and increased renovation costs. The extensive core testing of the concrete not only eliminated major delays further down the line, but also identified a problem that could have potentially caused detrimental effects to the surfacing system and underlying substrate should the primer have not been specified. The two external asphalt car park decks and ramps were also suffering an extensive amount of wear and damage; including wheel indentations, blistering and deformities within the asphalt and cracks which were allowing water ingress into the building structure. Due to the level of damage to the existing substrate, the aggregate below had become visible in certain areas. 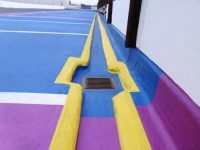 Providing a high level of anti-skid / anti-slip resistance, Triflex DeckFloor was specified for the external decks and ramps, and with its exceptional substrate compatibility Triflex DeckFloor could be applied directly to the existing asphalt substrate negating the need to remove completely and saving both the clients time and money.